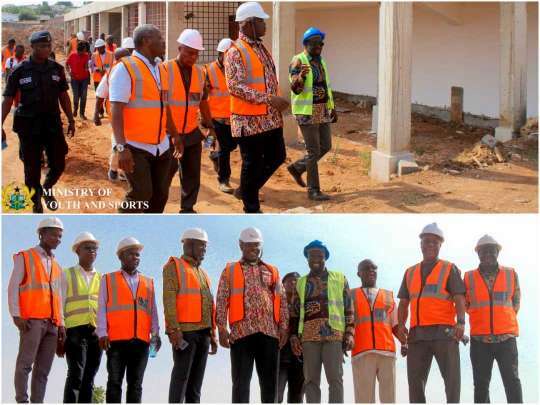 Mr. Isaac Kwame Asiamah, Minister of Youth and Sports, has said, the ministry together with the National Youth Authority (NYA), are ready to extend the completion time for the multi-purpose youth and sports resource center in Accra. According to Mr. Asiamah, the priority is to see a good work done at the centre, that would be able to stand the test of time, rather than getting the contractor to hurriedly complete the work. He made this known, when he together with Mr. Emmanuel Asigri, Chief Executive Officer, NYA paid a working visit to the Azumah Nelson Sports Complex today to inspect and ascertain progress of work at the center. He noted that the project, would house over fifteen indoor and outdoor sporting activities, adding that it was government’s intervention in the development of sporting infrastructure and also building a sustainable youth through sports and recreation. “We have come to inspect how work is going on here and I believe seeing the quality of work ongoing, I am happy, despite the challenges we had at this venue. “The contractor is seriously working, this place faced a peculiar site conditions, where there was an existing facility, which needed to be demolished to pave way for this new one, which obviously affected the completion time. “If there is the need for an extension of time to have quality work done, we would not rush him, the contractor would put in the application and justify why more time should be given and how much time needed and through the consultant’s advice, a decision would be taken, which would be based on getting quality work rather than rush the process” he said. Mr. Asigri reiterated the need for more time adding that per their assessment, the Azumah Nelson Sports Complex had faced the biggest challenge. “After demolition the old stands at the complex, there was another challenge of water but looking at how far he has come, I am encouraged. “He has completed four stands, which are major works and the rest are some minor works and we would have a modern center in no distance time, having in mind of value for money, not to have our investment gone waste ”he added.